The credit for the Manipuris being able to excel in various games and sports must go to the institution of Lai Haraoba. where a variety of indigenous games are still preserved for posterity, Mukna, Khong Kangjei, Sagol Kangjei, Chenjong-Mangjong, Lamjel, Thang-Ta, Boat Race etc. are parts of Lai Haraoba ceremony. The sporting spirit inherent in our forefathers and ancestors has been handed down from generation to generation through the tradition of Lai Haraoba, Undoubtedly, Manipur becomes the powerhouse of sports in the country. LAI HARAOBA depicts the theories of evolution and creation of life; social, cultural, political and religious aspects of Manipuris; natural, environmental and physical sciences; health, medicine and sports of the indigenous people; literature, dance and music; rites and rituals associated with the Manipuris. Lai Haraoba in itself is a university preserving and imparting knowledge on a variety of subjects. Meiteis have been a god-fearing community. Since times immemorial, Meiteis have been worshipping ancestral gods/goddesses and forefathers to bring prosperity to their land. It is believed that Gods held the first Lai Haraoba on the Koubru hill, so that their descendants imitate them and perform the same. It was done by the deities in order that their descendants never forget the secret and sacred story of the creation of this universe and the birth of the different lives on this earth. This is the origin of the festival of Lai Haraoba. Manipur is a land of deities with Atiya Shidaba as the supreme god. Atiya Shidaba, Apanba, and Asheeba are the three manifestations or incarnations of God as the creator, the preserver and the annihilator of this universe. Pakhangba, Sannamahi and Nongpok Ningthou are the incarnations who play the role of the male deities of the Meiteis, whereas Leimarel Shidabi and Panthoibi, the role of female deities. Sannamahi and Leimarel are worshiped in every house of the Meiteis. Various other gods and deities are worshipped in the "Umang Lai Laisangs" (temple of gods in the reserved woods with spacious grounds) in the villages. The Umang Lai Haraoba is the most important ceremony in which the deities are worshiped by all inhabitants of the village as a symbol of the part and parcel of the creation work. Meiteis take every male and female who play the role and deities in the Haraoba as god and goddess. There are six major types of Lai Haraoba namely Kanglei Haraoba, Chakpa Haraoba, Andro Haraoba, Sekmai Haraoba, Moirang Haraoba and Kakching Haraoba. Umanglai Haraoba is a ritual and religious festival consisting of fertility rites and worship of ancestors. It tells the theory of creation of the universe, earth and living things. It is a school of philosophy and thoughts of indigenous peoples of Manipur. The high ideals and civilization of indigenous groups are depicted in this festival. Lai Haraoba can also be defined as the annual conference of the villagers that bring in integration and understanding among them. It is also the training centre of the Manipuris. During Lai Haraoba festival, organizational skills and financial management are imparted to the villagers. Social discipline is strictly observed. Protection of environment, forests, flora and fauna, agriculture, horticulture, handloom and handicrafts are reflected. On the next day of Lairoi (last day), games such as Mukna, Kangjei and Lamjel are held and prizes are given to the winners. Thus, Lai Haraoba is the only cultural activity in which social, philosophical and religious life of the Meiteis is depicted very deeply and carefully. With this cultural activity, the continuous thought of the people of this culturally rich land is preserved from the long gone days never decaying and fading. The scientific and philosophical knowledge inherent in the Lai Haraoba needs to be thoroughly studied by the contemporary society. 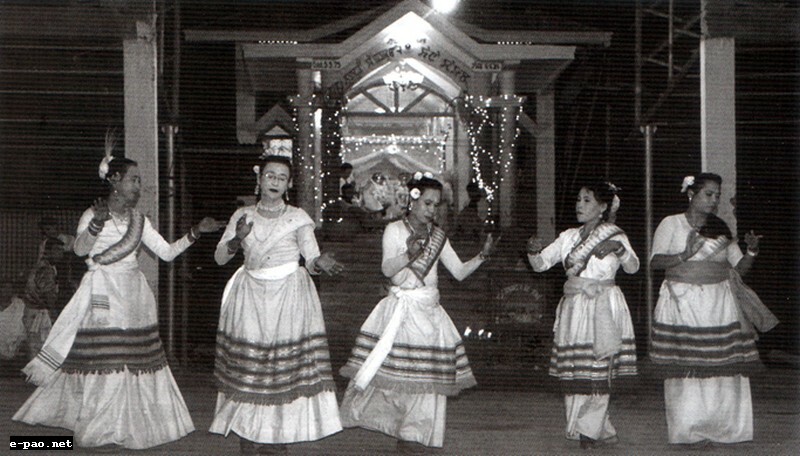 Identity and civilization of the Manipuris are reflected in this festival. Lai Haraoba is widely helpful in the socialization and nation making process of the Manipuris. It embodies the elements of common ancestry, integrity and communal harmony among the various communities residing in Manipur. Umanglai Kanba Apunba Lup (UKAL) formed by a number of socio-cultural organizations of the state in 2009 has been working towards conservation of the tradition of Lai Haraoba in Manipur. The objectives of UKAL include preservation of the originality of Umanglai Haraoba and its associated dance, music, ritual, customs and objects without polluting its essence. It also imparts training to the Amaiba, Amaibee, Pena Khongba etc. UKAL has been organizing a number of conferences, consultancies and guidance services besides reviving many Umanglai Laikon in Assam, Tripura etc. The society as a whole needs to support the cause of preserving Lai Haraoba as endeavored by the cultural organizations like UKAL.